Obesity is a major health problem worldwide. Visceral obesity and the pattern of fat distribution have important implications on the risk of developing metabolic diseases, mainly type 2 diabetes mellitus (DM) and heart disease. The aim of this study was to assess the relationship between obesity and central fat distribution (visceral obesity) and development of type 2 DM in women. This study included 200 women of different ages with their BMI more than 25 kg/m2 and waist circumference (WC) over 88 cm with or without a confirmed diagnosis of DM. Fasting blood glucose level, 2-h postprandial blood glucose level, HbA1c, and serum lipid pattern were measured. The approval of the medical ethics committee of El Mahalla and El Minshawi General Hospital and patient consent were taken before laboratory investigations were conducted on the patients. The prevalence of type 2 DM in the studied patients was 22%. The study showed statistically significant positive correlation between fasting glucose levels, 2-h postprandial blood glucose levels, total cholesterol, and triglycerides with both BMI and WC. It also proved that WC is a better method than BMI in the prediction of type 2 DM. Obesity with a high WC is a major risk factor for the development of type 2 DM in women. WC is considered a better and more convenient method than BMI in the prediction of type 2 DM. BMI 25 kg/m 2 or more: overweight (25–29.9 kg/m 2). BMI ≥30 kg/m 2: obese. Obesity grade I: 30–34.9 kg/m 2. Obesity grade II: 35–39.9 kg/m 2. Obesity grade III (morbid obesity): 40 or more. The prevalence of type 2 diabetes mellitus (DM) is increased at even modest levels of overweight: it is doubled at a BMI of 25 kg/m 2 compared with 21 kg/m 2. It is 10-fold higher at a BMI of 30 kg/m 2; above 35 kg/m 2, it is 42-fold higher in men and 93-fold higher in women . 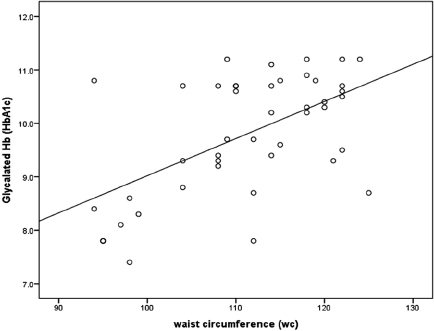 Waist circumference (WC) measurement is a convenient way of assessing the degree of central fat distribution. This method has proven to be a very useful way of assessing those who are most at risk for 'metabolic complications' of obesity and associated health problems as a result of storing excess weight around the abdomen . Recent studies have demonstrated a strong link between having a large WC and an increased risk of developing type 2 DM, independent of a person's BMI. It is found that overweight people with a large waist (defined in these studies as over 40 inches/102 cm for men and over 34.5 inches/88 cm for women) had a similar risk of developing DM to those who are clinically obese . This combination of increased waist measurement and elevated fasting triglycerides (TGs) is an easy way to identify those who are likely to have accumulated high-risk intra-abdominal or visceral fat. Those individuals who have the hypertriglyceridemic waist phenotype are at increased risk for metabolic complications, mainly type 2 DM and cardiovascular disease . The aim of the study was to assess the relationship between obesity and central fat distribution (visceral obesity) and development of type 2 DM in women. This study included 200 women aged 24–72 years who were selected from the medical outpatient clinic of El Mahalla and El Minshawi General Hospital, Gharbia government, Egypt. Women with BMI more than 25 kg/m 2 and WC greater than 88 cm with or without a confirmed diagnosis of DM were included in the study. Overweight women: 25–29.9 kg/m 2. Obese grade I: 30–34.9 kg/m 2. Obese grade II: 35–39.9 kg/m 2. Obese grade III (morbid obesity): 40 kg/m 2 or more. The approval of the medical ethics committee of El Mahalla and El Minshawi General Hospital and patient consent were taken before laboratory investigations were performed on these patients. Full medical history including previous illness and different metabolic disorders with particular emphasis on DM, obesity, and metabolic syndrome. Measurement of body weight and height to calculate BMI. Measurement of fasting blood glucose level. Measurement of 2-h postprandial blood glucose level. Serum lipid pattern [cholesterol, TG, low-density lipoprotein (LDL), and high-density lipoprotein (HDL)]. Weight was measured in light clothing without shoes after emptying the bladder. Height was measured as the distance from the top of the head to the bottom of the feet (no shoes) using a fixed stadiometer. BMI was calculated as weight (kg) divided by the square of height (m 2). Measuring at a level just above the iliac crest, and positioning the tape horizontally, irrespective of whether the umbilicus is above or below the tape, provides the correct WC measurement and corresponds to the maximal abdominal diameter. Normally the fasting blood glucose level should be 75–115 mg/dl; fasting blood glucose level equal to or more than 126 mg/dl is diagnostic of DM. Levels of fasting blood glucose more than 115 mg/dl and less than 126 mg/dl is defined as impaired fasting glucose. The level of blood glucose is measured 2 h after intake of 75 g glucose. Normally it is less than 140 mg/dl. Level of postprandial glucose equal to or more than 200 mg/dl confirms the diagnosis of DM. It is produced by a reaction between glucose and the terminal valine of the B chain of the hemoglobin molecule. Normally, it is up to 6.4% of the total hemoglobin. In diabetic patients it reaches about 20%, and reflects the metabolic control over the preceding 6 weeks. Estimation of serum cholesterol and TGs was done by means of cholesterol enzyme colorimetric assay on a Ciba Coming Express Plus Analyzer (Ciba Corning Diagnostics; Fernwald, Germany) using a commercially available kit (Boehringer, Mannheim, Germany). The normal range for cholesterol is 130–200 mg/dl. The normal range for TGs is 40–140 mg/dl. Estimation of serum HDL-C was done by precipitation with dextran sulfate (Ciba Corning Diagnostics). Normal range for HDL is 35–75 mg/dl. LDL-C was calculated according to the Fridwald formula as follows: LDL = total cholesterol-(HDL-C+TG/5). Descriptive statistics, including mean and SD for quantitative data and frequency and percentage for qualitative data. Analytic statistics, including the t-test for comparison of two independent normally distributed quantitative variables, the Mann–Whitney U-test for comparison of two independent non-normally distributed quantitative variables, the χ2-test for comparison between two independent normally distributed qualitative variables, the Person correlation coefficient (r) for comparison between two dependent non-normally distributed quantitative variables. P values greater than 0.05 were considered statistically nonsignificant, P values less than 0.05 were considered statistically significant, and P values less than 0.001 were considered statistically highly significant . This study was conducted on 200 women aged between 24 and 72 years. They were categorized on the basis of their BMI into overweight (25–29.9 kg/m 2), representing 26.5% of cases, obese grade I (30–34.9 kg/m 2), representing 47.5% of cases, obese grade II (35–39.9 kg/m 2), representing 21% of cases, and obese grade III (morbid obesity) (≥40 kg/m 2), representing 5% of cases. The WCs of these women were between 92 and 125 cm, with a mean WC of 105.4 cm. [Table 1] shows the measurement of fasting blood glucose and 2-h postprandial blood glucose of the studied women. The study found that the number of women who had DM was 44, whereas 156 were nondiabetic. [Table 2] shows the measurement of the serum lipid pattern of the studied women. This study shows a statistically highly significant difference between diabetic women and nondiabetic women as regards both BMI and WC (P< 0.001), as demonstrated in [Table 3]. 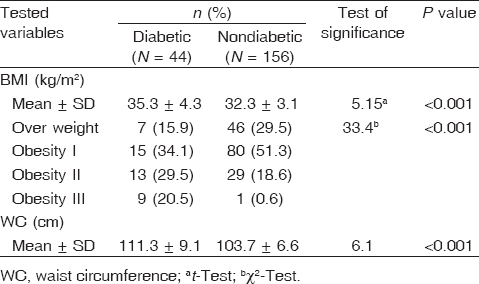 [Table 4] shows the validity of BMI and WC in the prediction of type 2 DM. BMI at cutoff 32.86 kg/m 2 was 70.5% sensitive and 63.5% specific in the prediction of type 2 DM, whereas WC at cutoff 107.5 cm was 75% sensitive and 69.9% specific in the prediction of type 2 DM. This proved that WC is a better method than BMI in the prediction of type 2 DM. [Table 5] shows statistically highly significant positive correlation between fasting blood glucose level and BMI, WC, total cholesterol, TGs, and LDL (P< 0.001) in the studied women, and a statistically significant positive correlation between fasting blood glucose and HDL (P< 0.05). The prevalence of type 2 DM in the studied group was 22%, as shown in [Figure 1]. 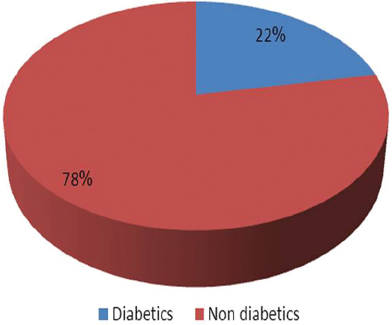 Figure 1: The prevalence of type 2 diabetes mellitus. [Figure 2] shows the receiver operating characteristic curve for the prediction of DM as regards WC. The area under the curve was 0.74 and P value was less than 0.001. Figure 2: Receiver operating characteristic curve for waist circumference. [Figure 3] and [Figure 4] show statistically significant positive correlation between fasting blood glucose level and both BMI and WC. The level of fasting blood glucose increased with an increase in BMI and WC. Figure 3: Correlation coefficient between waist circumference and fasting blood sugar (FBS). Figure 4: Correlation coefficient between BMI and fasting blood sugar (FBS). [Figure 5] shows a statistically positive correlation between HbA1c and WC. The level of HbA1c increased with an increase in WC. Figure 5: Correlation coefficient between waist circumference and glycosylated hemoglobin. Over time, persistent high blood glucose levels can damage the body's organs. This damage is defined as DM-related complications. These complications are serious and can be life threatening. People with DM have an increased risk of developing serious diseases affecting the heart and blood vessels, eyes, kidneys, nerves, and teeth. In addition, people with DM also have a higher risk of developing infections. In almost all high-income countries, DM is a leading cause of cardiovascular disease, blindness, kidney failure, and lower limb amputation. With appropriate lifestyle changes and attention to blood glucose control, people with DM can substantially reduce the risk of complications . Visceral fat in particular appears to be associated with insulin resistance, which leads to type 2 DM. It acts hormonally, by secreting a group of hormones called adipokines that induce impaired glucose tolerance . In this study the number of women with DM was 44, whereas 156 women were nondiabetic. The prevalence of type 2 DM in the studied group was 22%. It shows that there is a statistically highly significant difference between diabetic women and nondiabetic women as regards age and BMI (P< 0.001). The incidence of type 2 DM was found to increase with an increase in age and BMI . Our results were similar to those of Abolfotouh et al. , who conducted their study on 8351 adults from Egypt aged 20 years and above. Their study found a significant correlation between obesity and DM, with the incidence of DM increasing with an increase in BMI. The crude prevalence rate of known DM in Egypt in 2008 was 4.07%. It increased with age, to reach 19.8% among women aged 50–59 years. Only 18% of men and 7.8% of women had a normal BMI. Recent studies have demonstrated a strong link between a large WC and an increased risk of developing type 2 DM, independent of a person's BMI. It is found that overweight people with a large waist (defined in these studies as over 40 inches/102 cm for men and over 34.5 inches/88 cm for women) had a similar risk of developing DM to those who are clinically obese . Our study revealed a statistically highly significant difference between diabetic and nondiabetic women with respect to WC (P< 0.001). It also found a statistically highly significant positive correlation between fasting blood glucose level and 2-h postprandial blood glucose level and WC in the studied women (P < 0.001). In our study, we found that BMI at cutoff 32.86 kg/m 2 was 70.5% sensitive and 63.5% specific in the prediction of type 2 DM, whereas WC at cutoff 107.5 cm was 75% sensitive and 69.9% specific in the prediction of type 2 DM. It also revealed a statistically highly significant positive correlation between HbA1c and WC (P< 0.001) and a statistically significant positive correlation between HbA1c and BMI in diabetic patients (P< 0.05). This proved that WC is a better method than BMI in the prediction of type 2 DM. Wang et al. and Petersen et al. found that WC is a stronger predictor of DM compared with BMI. The relative risk of developing DM between individuals in the highest and lowest categories of reported WC often exceeds 10, and it remains statistically significant after adjustment for BMI. These data demonstrate that WC can identify persons who are at greater cardiometabolic risk compared with BMI alone. In a study of Mexican–Americans, Wei et al. found that WC was the best obesity-related predictor of noninsulin-dependent DM, with a predictive effect equal to that of waist hip ratio and BMI combined. The authors argue that abdominal localization of body fat is a more important determinant than total amount of body fat in this population (mean age 42 for men and 43 for women). Another study was performed by International Day for the Evaluation of Abdominal Obesity (IDEA) . The study took place in 2005 and involved the measurement of BMI and WC of 68 000 patients by randomly chosen physicians in primary care in 63 countries, with simultaneous recording. The IDEA study demonstrated a statistically significant graded increase in the frequency of cardiovascular disease and DM with both BMI and WC. Importantly, a stronger relationship was observed for WC than for BMI in relation to cardiovascular disease and DM. This finding was observed for both men and women across the regions studied as part of this international investigation. The frequency of DM showed an even stronger graded increase across WC quintiles; in men it increased more than three-fold (from 5.7% DM prevalence in the lowest WC quintile group to 19.4% DM prevalence in the highest WC quintile group) and in women it increased by almost six-fold (3.1–17.8%). The combination of an elevated WC and elevated fasting TG level 2.0 mmol/l or more defines the hypertriglyceridemic waist phenotype . Our study found a statistically highly significant difference between diabetic women and nondiabetic women as regards serum lipid pattern (P< 0.001). It found a statistically highly significant positive correlation between fasting blood glucose level and 2-h postprandial blood glucose level and total cholesterol, TGs, and LDL (P< 0.001), and a statistically significant positive correlation between fasting blood glucose and 2-h postprandial blood glucose level and HDL (P< 0.05). Kissebah et al. conducted a study to identify the relationship between WC and biomarkers for DM and cardiovascular disease in healthy nonobese women. 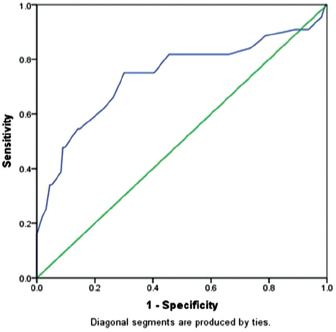 Nondiabetic, nonobese, middle-aged women were categorized by WC quartiles. The correlation of WC to fasting plasma glucose, HbA1c, lipid profile, C-reactive protein, and white blood cell count was examined. Two hundred women between the ages of 40 and 54 were examined. Women outside the specified age range, who were obese (BMI ≥30), or those who took medication to lower their cholesterol were excluded from the study. The study found that WC correlated with fasting blood glucose level and C-reactive protein (r = 0.279 and 0.414, respectively), whereas WC did not correlate with HbA1c or white blood cell count. Also, the correlation between WC and lipids was strong and did not change significantly when adjusted for menopause or other confounders. The strongest correlations were found between WC and TGs (r = 0.465, P = 0.000) and between WC and cholesterol/HDL (r = 0.321, P = 0.000). We found that the pattern of fat distribution is an important risk factor for development of type 2 DM. BMI and WC were used in this study to express the different grades of obesity. The study proved that WC is a better and more convenient method than BMI in predicting type 2 DM. The glycemic parameters of fasting blood sugar, 2-h postprandial blood glucose level, HbA1c, and lipid profile showed a statistically significant positive correlation with BMI and WC in the women. Loss of excess body weight and visceral fat is recommended for obese patients to prevent or retard the progression of pre-DM to frank type 2 DM. [No authors listed]. Obesity preventing and managing the global epidemic. Report of a WHO consultation. World Health Organ Tech Rep Ser 2008; 894:i–xii, 1–253. Jensen MD. Role of body fat distribution and the metabolic complications of obesity. J Clin Endocrinol Metab 2008; 93 (Suppl 1): S57–S63. Flint AJ, Rexrode KM, Hu FB, Glynn RJ, Caspard H, Manson JE, et al. 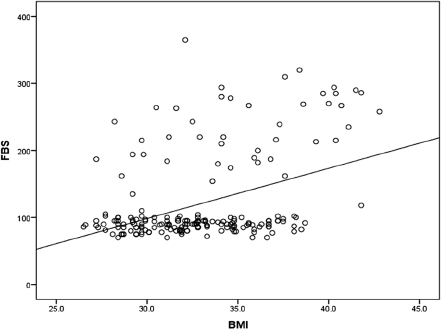 Body mass index, waist circumference, and risk of coronary heart disease: a prospective study among men and women. Obesity Research and Clinical Practice 2010; 4:e171–e181. St-Pierre J, Lemieux I, Perron P. Relations of the 'hypertriglyceridaemic waist' phenotype to earlier manifestations of coronary heart disease in patients with glucose intolerance and type 2 diabetes. Am J Cardiol 2007; 99:369–373. Abdel Wahab F. Statistical analysis. Menoufia, Egypt: Department of Public Health, Faculty of Medicine, Menoufia University; 2014. Garber AJ, Abrahamson MJ, Barzilay JI, Blonde L, Bloomgarden ZT, Bush MA, et al. AACE comprehensive diabetes management algorithm 2013. Endocr Pract 2013; 19:327–36. Duman Bs, Turkoglu C, Gunay D, Cagatay P. The relationship between insulin secretion and action in type 2 diabetes with different degrees of obesity. Evidence supporting central obesity. Diabetes Butr Metab 2003; 16:243–250. Vinciguerra F, Baratta R, Farina MG, Tita P, Padova G, Vigneri R, Frittitta L. Very severely obese patients have a high prevalence of type 2 diabetes mellitus and cardiovascular disease. Acta Diabetol 2013; 50:443–449. Abolfotouh MA, Soliman LA, Mansour E, Farghaly M, El-Dawaiaty AA. Central obesity among adults in Egypt: prevalence and associated morbidity. East Mediterr Health J 2008;14:57–68. Wang Y, Rimm EB, Stampfer MJ, Willett WC, Hu FB. Comparison of abdominal adiposity and overall obesity in predicting risk of type 2 diabetes among men. Am J Clin Nutr 2005; 81:555–563. Petersen KF, Dufour S, Befroy D, Garcia R, Shulman GI. Impaired mitochondrial activity in the insulin-resistant offspring of patients with type 2 diabetes. N Engl J Med 2004; 350:664–671. Wei M, Gaskill SP, Haffner SM, Stern MP. 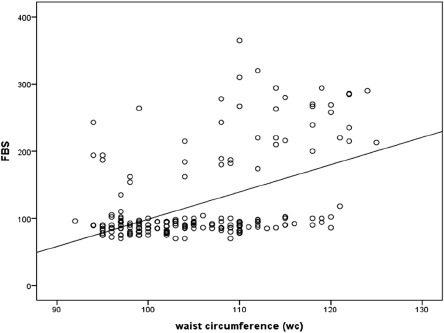 Waist circumference as the best predictor of noninsulin dependent diabetes mellitus (NIDDM) compared to body mass index, waist/hip ratio and other anthropometric measurements in Mexican Americans – a 7-year prospective study. Obes Res 1997; 5:16–23. Lemeiux I, Almeras N, Mauriege P. Prevalence of 'hypertriglyceridaemic waist' in men who participated in the Quebec Health Survey: association with atherogenic and diabetogenic metabolic risk factors. Can J Cardiol 2002; 18:725–735. Kissebah AH, Vydelingum N, Murray R, Evans DJ, Hartz AJ, Kalkhoff RK, Adams PW. Relation of body fat distribution to metabolic complications of obesity. J Clin Endocrinol Metab 1982; 54:254–260.